Dr. Ravi Singh completed his MBBS from Gwalior and post-graduation in Orthopaedics from University of Pune, India. He then did his MCh in Orthopaedic Surgery from UK which is accredited by Royal College of Surgeons of England, UK. Dr. Ravi with an experience of 17+ years had been working in India as an Orthopaedic surgeon before coming to UAE in 2008. During his practice in India he was dealing with management of various fractures using both conventional and minimal invasive techniques. He was also performing total hip and knee replacements. He has special interest in management of various musculoskeletal problems of hand, foot and back. 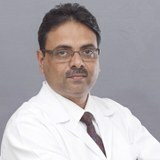 Dr. Ravi has delivered lectures for CME programmes and also has publications in many journals to his credit. He is a member of International Society of Orthopaedic Surgery and Traumatology (SICOT). Dr. Ravi can speak in English Hindi and Urdu.